If you thought things were going to start getting easier for Lori, JT and Dakota, after the events in the last book, then think again. In Deep Dirty Truth Lori’s past is about to come back and haunt her in a big way. 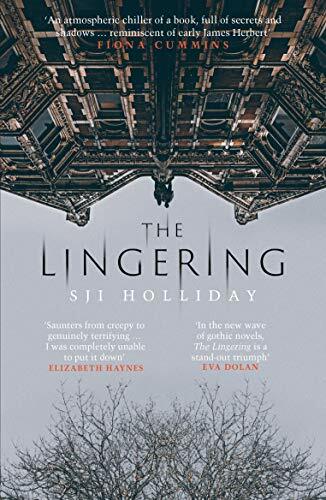 Steph Broadribb turns the tension up a notch once again, with action right from opening pages which carries through to the nail-biting ending. This is my favourite Lori Anderson novel yet. I love, love, love these books. Lori and JT are well rounded characters who you can’t help but root for all the way through. In the latest book, Lori is on her own again as JT is still recovering from the events which concluded the last book in the series. But this situation is certainly one that Lori wouldn’t choose to be in. But she knows she can’t refuse the orders she is being given as it will put her own family’s life at risk and you do get the sense that things could go either way for them this time, nothing is certain. I don’t want to go into too much detail about the plot as this is such a tension filled read that I want you to enjoy it for yourself. There are some vicious crooks in book three that will make you fearful for Lori and her family, and the wide expanse of the American landscapes make the perfect scene for the car chases that take place and the violence that ensues from the opening pages. It creates a huge sense of unpredictability, as out in the wilderness, far away from civilisation, and where phone signal can be patchy as well, crimes can easily be covered up. If you do like action filled reads right from the get go then you really need to be reading the Lori Anderson series. The chapters are short and snappy, and they will make you want to turn those pages. I actually started reading this book on New Year’s Eve, and I would have been quite happy to stay in and read for the rest of the evening, rather than go out and see in the New Year, and that to me shows just how captivating this story is. The cinematic edge to these books and the tension charged plot is what makes the Lori Anderson series a real winner for me, it’s a series that just keeps getting better and better. This is another fantastic book from Steph Broadribb; I can’t wait to catch up with Lori and JT again. Thank you to Anne Cater at Random Things Tours for inviting me to take part in the blog tour and to Karen Sullivan for sending me an advance review copy. 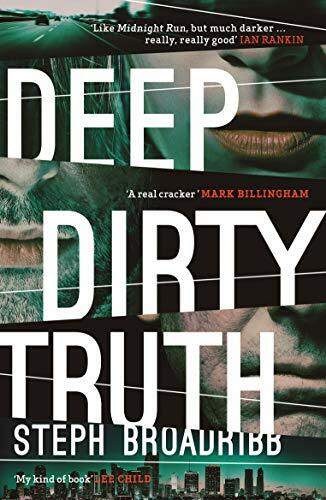 If you would like to purchase Deep Dirty Truth you can do so by clicking on one of the following links below. 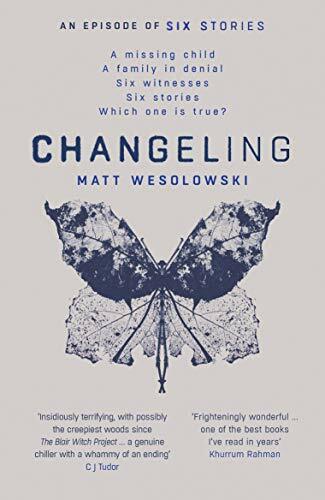 Matt Wesolowski has written another cracking story with Changeling. Literally, once I started reading this, I couldn’t stop. This version of Six Stories sees our presenter, Scott King investigating a thirty-year-old cold case. Seven-year-old Alfie Marsden disappeared near a forest in Wiltshire in 1988 on Christmas Eve, and the mystery surrounding his disappearance has haunted many people for three decades as it has never been solved. It seems that no one is ever going to understand the truth as to what happened to Alfie that night, but Scott King is determined to try and find the answers. I absolutely love the style of Matt’s books. Telling the story through a series of podcasts is a very original idea, and with each book I’ve read by him, I’ve felt as though I was learning about a true crime that has taken place, rather than a fictional one. There is always a very creepy element to these books which is another thing I really like about them. In the last book Hydra, I remember feeling compelled to research the black-eyed children, which Matt was referring to, but I was too frightened to do so after reading the book. Changeling has the essence of a Brother’s grim fairy-tale. As Scott King looks into Alfie’s disappearance, he examines numerous reports of strange, “paranormal” activities which were taking place in and around the forest area at the time Alfie went missing. There are also mentions of “changeling children”, children who are swapped by fairies; the human child was taken to live in their realm only to be replaced in our world by a beastly child. I have to admit here that reading about the changeling children, did creep me out quite a bit. There is a lot of talk about folklore in this book, and this is what made this story so fascinating to me, as I wondered if these stories had any bearing on what had happened to Alfie. Once again we hear from the viewpoints of six people who were somehow connected to the case, Alfie’s family, witnesses to the strange events that took place and his teachers. As I got to read their thoughts and opinions, the case became even more interesting, and I was so keen to get to the bottom of it all. As the story is told in the form of an interview, through a podcast, I think it would make an excellent audiobook, so if you are an audio listener, I would definitely recommend giving this one a go as well as the other books in the series. I really did not expect the direction this book took as the final revelations about the case came to light. Matt Wesolowski took me totally by surprise by the twist, and I’ve spent days thinking about it, especially as I’ve tried a few times to sit down and write this review. I am wondering now how he is going to take the series from here, and I hope there is going to be another book. Changeling is another outstanding addition to this series. The writing will pull you in from the first page, and you won’t be able to stop reading until you find out the truth about what has happened to Alfie. Thank you to Anne Cater at Random Things Tours for inviting me to join the blog tour and to Karen Sullivan for the advance review copy. 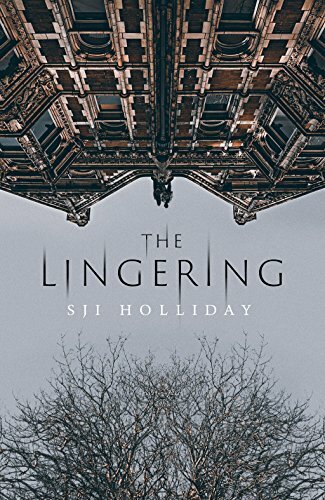 If you would like to purchase Changeling you can do so by clicking on one of the following links below. Attend by West Camel, is unlike anything else I have read this year. I don’t usually read contemporary fiction, but I am so glad I read this book. It is a very hard book to define, as it can easily fit into many genres: crime, magic realism and even romance. Deborah is the lead character in this book who holds everything together and she does become the centre of our focus. Then there are the characters, Anne and Sam, both who are very different to each other, but who ultimately are pulled together in this wonderful, mesmerising and addictive plot. It is a very strong debut that I suspect I’ll be talking about and recommending for a while. Anne is the first character we are introduced to, a recovering heroin addict, who has just moved into her new home in Deptford. She meets Deborah who comes across as a vulnerable, lonely old woman, but she has a fascinating past which she begins to divulge to Anne. In the end, for me, Deborah came across as one of the strongest characters in this book, which I was surprised by. We are then introduced to Sam who has only recently begun to accept his sexuality, and he forms a relationship with a local thug, Derek, who is well known in the area, which means he has a reputation to uphold. Their newfound relationship is a move that surprises both of them. Sam is also drawn in by Deborah and her compelling stories. These three threads are stitched together in a very clever, and a very well plotted way. It was the characters in this book which made this book such a compelling read, and West Camel’s writing swept me into his story from the first page and into the murky areas of Deptford. One theme that does come across strongly in this book is the theme of loneliness, and this is what I did think of whenever I thought about Deborah and her stories. There are some flashback scenes in this book when she is revisiting her past, as she is re-telling it to Anne and Sam, and these scenes really did make me want to concentrate as I tried to understand her character more. West Camel’s writing is what made this book feel so very fresh and unique; there are some wonderful descriptive phrases throughout Attend that added so much depth and colour to his characters and the settings. He is such an exciting new writer and I cannot wait to see what he writes next. If you’re looking for a book that is dark, has very good writing, but very different to what is currently out there in the market at the moment, then I would highly, highly recommend Attend. It is a stunning piece of fiction. I loved it. Thank you to Anne Cater at Random Things Tours for inviting me to join the blog tour and to Karen Sullivan at Orenda Books for sending me a copy of the book to review. I turned the pages at breakneck speed reading Trap. Having read and enjoyed Snare, the first book in the series last year, I couldn’t wait to see how the series would follow on, and Lilja Sigurdardóttir has created a tense, action packed read that will keep readers enthralled. Once again the reader is taken into a corrupt world of bankers, money laundering, drug dealers and drug mules. If you’re looking for a unique crime series, that has fascinating characters, then I definitely recommend both of Lilja’s books, and the good news is, is that there will be another book to follow. From the first page, we are thrown into Sonja’s chaotic new world, and Lilja wastes no time in ratcheting up the tension. Sonja has escaped to Florida with her son, Tomas, in her bid to keep him away from his father who currently has full custody. And Tomas’s father is soon hot on their tales, making Sonja’s new life very dangerous. We also meet up with Sonja’s lover, Agla, back in Iceland, who is being investigated for money laundering after the aftermath of the financial crash. And still, Agla is getting involved in tricky situations to help pay the debt that she owes. But Agla and Sonja’s relationship isn’t quite what it is in the first book, and there is tension between them. You strongly get the sense that Sonja is trapped in the world that she has become a part of and that it will be very difficult for her to get out. This is what makes Trap such an exhilarating read as Sonja is never sure what’s going to be around the corner for her next. She is desperate to go back to her normal life. What comes across so strongly in this book is her love for her son. This is what makes Sonja so engaging as she will do anything to have her son living with her full time, but this is what also makes her vulnerable to the people who will try to use her. This was a book I was totally gripped by. It is a well researched and an original thriller that will keep you reading. I can’t wait for the next book in the series. Thank you to Anne Cater at Random Things Tours for inviting me to take part in the tour and to Karen Sullivan at Orenda Books for sending me a copy of the book to review. Sometimes a book comes along which you just want to shout from the rooftops about, and Overkill for me is that book. I’d heard many great things about it so my expectations were high and they were certainly met. I’m going to be pressing this book into the hands of everyone who I know who loves crime fiction. This is one of the best introductions to a new crime series that I have read. As I was reading the prologue, I was just staring wide-eyed at the page, completely engrossed by the character’s dilemma and what she was facing at that moment. And I knew that this wasn’t going to be an easy case for the police to investigate. What first drew me to Overkill was the book’s setting. The author, Vanda Symon, sets the novel in her home country, New Zealand. I haven’t read any books set in this part of the world before. In her debut novel, Vanda Symon paints a portrait of a friendly, tight knit community and it seems an idyllic place to live, everyone knows each other’s business. The crime rate appears to be low, and nothing untoward seems to happen, which is why the discovery of the body of one of their own, sends the community, and even the police working on the case into shock. I did wonder how the case was going to affect the town in the long run, especially if there wasn’t a quick resolution. I was beginning to imagine that there would be many pointing the finger at each other and playing the blame game. Detective Constable Sam Shepherd, who is on the team investigating the case, is acquainted with the woman who has been found and with the victim’s husband as well. Her connection to the individuals at the heart of the crime is what makes this case particularly personal and difficult for her, even more so as she still has strong feelings for the victim’s husband. But Sam tries her best to find out what happened, even when there are many obstacles thrown in her way. She certainly isn’t given an easy time with this case, and this is what makes this book tense and exciting, I wanted to see how she was going to get out of the situation she was now in. But to find out what happens to Sam, you’re going to have to pick up the book to find out as I won’t be revealing anything here. I did have a huge amount of empathy for Sam throughout the book. I think she is a character who fears change, and she is a person who becomes very attached to people who she knows well, particularly her friend Maggie. But when it comes down to the case, she is determined to get to the bottom of what has happened, and she is feisty in her determination to bring the perpetrators of the crime to justice. I loved Vanda Symon’s writing style. When I started reading the book, I knew that it wouldn’t take me long to finish. I liked that every now and again there was a slice of humour, which really added to Sam’s characterisation and the people around her. After reading Overkill I’m really excited to read what Vanda writes next. Overkill is an immersive, page-turner that will have you gripped from the chilling opening right through to the heart pounding conclusion. Thank you to Anne Cater at Random Things Tours for inviting me to take part in the blog tour and to Karen Sullivan at Orenda Books for sending me a copy of the book to review. I’m delighted to be joining the blog tour for End Game today, the third and sadly, final book in the Robert Finlay series by Matt Johnson. 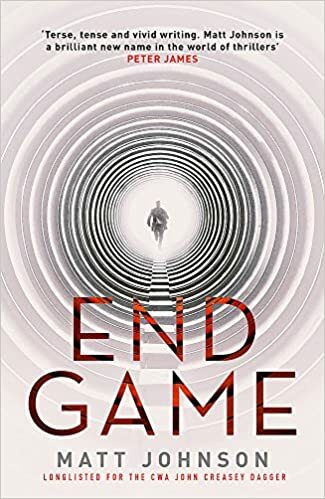 End Game is the third and final book in the brilliant Robert Finlay series by Matt Johnson and it is a series which I highly recommend to any thriller seekers. I’m sad to see this series come to an end as I will definitely miss these characters. Matt also writes really well and so I am sure that I’ll be picking up what he writes next as I really like his style. Before you pick up End Game I would recommend that you read the first two books in the series, which began with Wicked Game, although they can all be read as standalones, I feel you would get more enjoyment out of them if you read all three. It seems that Robert Finlay will never quite be granted his wish of enjoying a quiet life with his wife and two children. He has put his military days behind him; however he has since joined the Metropolitan police as an Inspector. But when his friend’s girlfriend is murdered he is thrown into a chaotic mess as he tries to prove his friend’s innocence. He can’t believe that his friend had any involvement in this woman’s murder. But his friend only makes matters worse when he escapes from jail. And as Robert struggles to clear his name, he learns that someone is plotting to kill them both. Will they both manage to survive? What I really like about these books is their authenticity. Matt Johnson is a former soldier and police officer, and his own, personal experiences feeds into the Robert Finlay novels. He offers us a fascinating insight into the worlds of policing and spies at the very highest level of security. Although the Robert Finlay novels are works of fiction, Matt does refer to real, historical events which only occurred in this country a few decades ago and this is another part of the plot which I found really interesting and it compelled me to research them. One of my favourite characters from this series, I would say, would have to be Toni Fellows. She is a force to be reckoned with and I really liked the working relationship that she has with Finlay. If you are on her side, she is a friend who will do anything for you. End Game is a fitting end to a fantastic series. If you haven’t yet discovered these books and if you’re a fan of action packed, spy thrillers, then you definitely need to add them to your TBR pile. Thank you to Karen Sullivan at Orenda Books for sending me a copy of the book to review and to Anne Cater for inviting me to take part in the blog tour. I’m delighted to be joining the blog tour for Killed today. 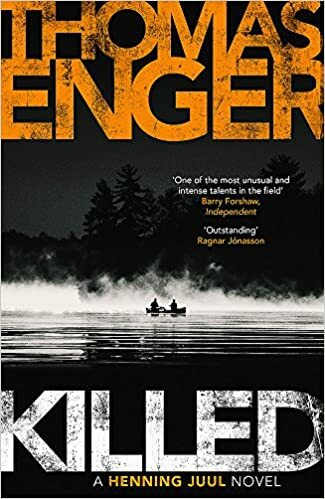 The final book in the Henning Juul series by Thomas Enger which is published by Orenda Books and translated by Kari Dickson. Killed is the finale in the Henning Juul series by Thomas Enger and what a brilliant end to the series it is. I first discovered this series when I read his previous novel Cursed, and I was hooked on Henning’s story. I still need to read the first three books; they are high up in my TBR pile. Enger’s Henning Jull series is an emotive, twisty and gripping journey. It follows Henning as he attempts to find his son’s killers in his quest for the truth. Cursed ended with a revelation that made me desperate to read the next book, and the moment my copy of Killed arrived, I couldn’t wait to read it. If I were to start this series again, I would go right back to the beginning, and this is what I would suggest if you are interested in reading this series. But what I did find helpful is that there is a cast of characters at the front of the book, so if you are coming to the Henning Juul books for the first time, it is possible to read it as a stand-alone. Thomas opens his latest novel with a prologue that will really make you step back and think before it urges you to read the rest. Killed can very easily be read in one sitting. As I mentioned earlier, this is an emotional read as Henning tries to uncover who killed his son. It is clear that he will try and attempt this by any means possible, he has little care in the world if anything should happen to him in the process, and this is what makes him a reckless and an exciting character to follow. Someone is desperate to try and silence Henning however, and this is where the tension in the novel rises. The last two Henning Juul novels which I have read have been translated really well. The descriptions of the Norwegian landscape drew me into the setting. From the start of the book, there is a strong sense of foreboding and it is clear that there are going to be obstacles set in Henning’s way as he attempts to reach the truth, be prepared for shocking and heartbreaking scenes. Although it is sad to see this series come to an end, Thomas certainly couldn’t have given this series a better one. But I still have the first three books to read, so I’m looking forward to finding more about Henning. I’m sure that Thomas has more exciting books up his sleeve. Thank you to Karen Sullivan at Orenda Books for sending me a copy of this book to review and to Anne Cater for the invitation to join the blog tour.